What do Jerry Garcia, Miles Davis, Anton Refregier and Sally Rand all have in common? All directly impacted the dynamic, diverse, largely forgotten history of San Francisco’s Tenderloin neighborhood, now remembered on nine new sidewalk plaques dotting the Uptown Tenderloin Historic District. 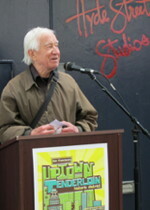 Key figures associated with Tenderloin history shared past stories about the lost landmarks at Hyde Street Studios, 245 Hyde St. (formerly Wally Heider Recording, site of legendary rock recordings from late 1960’s-70s) on April 25. Attendees included those who played with Thelonious Monk at the neighborhood’s famed Blackhawk Jazz Club, and the engineer for legendary recordings by Crosby, Stills, Nash & Young, Creedence Clearwater Revival, the Grateful Dead and other rock legends. Fortunately, Heider’s legacy has been continued since 1980 by current Hyde Street Studio’s owner Michael Ward. Ward gave attendees at the event tours of the historic sound studios. Heider’s history had started out earlier in the Tenderloin across the street at the Blackhawk Jazz Club, active as a jazz venue from 1950-1963. Heider recorded trumpeter Miles Davis’s legendary, “In Person Friday and Saturday Nights at the Blackhawk,” 1961 recordings. Local bassist Dean Reilly recounted his days playing at the Blackhawk where he regularly played with a house trio. One night, club owner Guido Cacianti phoned Reilly asking him to sit in with pianist Thelonious Monk whose band hadn’t shown up for the gig. In honor of the Blackhawk plaque, jazz writer Doug Ramsey detailed the history of the Blackhawk and its legacy in his Rifftides online column. It can be found here. Their revolt with police on an August evening in 1966 woke up the establishment prompting new public policies and social services that improved the lives of local transgender people. Carol Cuenod recalled her days at the California Labor School at 240 Golden Gate Ave. (currently the home of SEIU Local 87) from 1948-51, where she participated in the Labor Chorus. The Chorus serenaded workers on picket lines, and reflected the schools integrating of art, music, and labor culture. The Labor School’s presence in the Tenderloin reflected the many unions based in the neighborhood; it was effectively shut down in 1951 by the anti-communist red scare that began in the late 1940’s. Other Tenderloin plaques celebrate the first hard-core adult feature film shown in the U.S. at the Screening Room, 220 Jones Street, Sally Rand’s burlesque fan dances at the Music Box now Great American Music Hall, 859 O’Farrell Street, the former B’nai Brith, 149 Eddy Street, the former Original Joe’s, 144 Taylor Street, and the former Arcadia Dance Pavilion/Downtown Bowl at the corner of Eddy and Jones Streets at Boedekker Park. A $12,500 grant from SF Grants for the Arts funded the sidewalk plaque project. Centrix Builders provided expertise in metal work with installation by Michael Heavey Construction. Uptown Tenderloin, Inc. spearheaded the project. Its past projects in the historic district include nearly the installation of nearly 100 plaques on historic buildings, and mural restorations in the Taylor St. Arts District. It is working on plans for an Uptown Tenderloin Museum to be housed at the Cadillac Hotel on the corner of Eddy & Leavenworth Streets.